It's the battle of Metropolis, Superman and Lex Luthor vs Doomsday. Upstate. 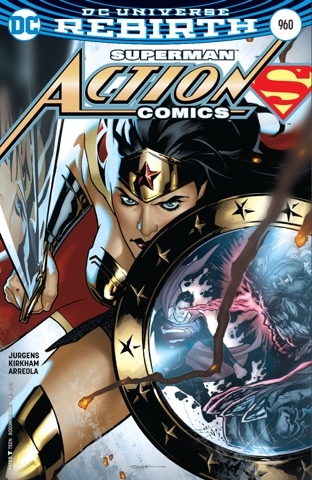 Lois, with son Jon at her side, watches Clark emerge from the site of an explosion to resume his fight with the unstoppable monster. Wonder Woman appears, joins the battle and meets the man claiming to be Clark Kent. She, reasonably, assumes he's been put in place by Superman to help him reclaim a secret identity, something Superman denies. There's more to the story than that but I shall let you discover it for yourself - you'll like it! Well, you will if you're anything like me - you'll enjoy the easy teaming of the New 52 Wonder Woman with a version of the man she loved, a man she recently watched die. You'll like the intelligence of Lois and her determination to protect Jon. Superman remembering that he needs to be fighting Doomsday somewhere away from ordinary citizens. A new aspect of Jon's Kryptonian heritage emerging. And most of all, you'll love this scene. Not everyone will be a fan. Some people liked the Clark/Diana romance and that's fair enough. Me, though, I'm delighted to see that even Wonder Woman recognises the rightness of Lois and Clark for one another. And I'm thrilled that Lois and Diana's first instinct towards one another is friendship. Destiny of the Endless, who before he was a big-time favourite of Neil Gaiman was a humble horror comic host who once guest starred in Superman. That's Destiny, Greek name, Potmos... which could by misheard as PotmOZ - hey, stranger things have happened. And his being surprised by un-Super Clark means nothing, his Cosmic Log was always getting stuff wrong. I'm not putting this forward as a serious theory, I was just struck by the fantastic image by illustrator Tyler Kirkham and colourist Ulises Arreola. The rest of their art is less painterly, but rather nice nonetheless, with the fight scenes especially effective - they're big and daft and loud as you please. Jurgens doesn't wrap the story here, ending on another Doomsday cliffhanger, but I'm nowhere near bored - the action, emotion and mystery of this book has me well and truly grabbed. Digital readers get two covers, the excellent regular by artist Clay Mann and colourist Sonia Oback, with Diana showing off one powerful leg, and the variant by Ryan Sook, which is eye-poppingly lovely. A shout-out, too, to lettering stalwart Rob Leigh for showing just how much drama you can eke out of a well-chosen font. I'm loving the fortnightly Supeman books, and this is one of the best yet. It feels...true. Seems unfair to say WW is plodding after just three issues, especially with there being two distinct stories being told. Two distinct, but very slow stories. One pedestrian pre-origin. Two issues of the Lies and Diana has fought some monsters and reassured Cheetah she still likes her, while pages and pages are wasted with radio talk and getting somewhere supposedly overwhelming that just looks like a bunch of trees. Anyway, that's another review. Which I probably won't bother with now! I've seen a tweet from Jurgens thanking Rucka for his perspective on Wonder Woman so I imagine the two of them had a chat at some point about how they felt Diana would react to the old Superman and Lois as a couple. 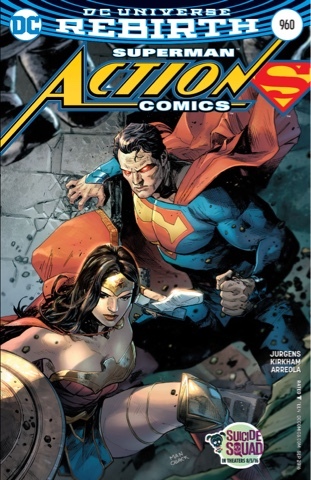 Though it did feel like a mouth piece for reaffirming the Clois romance rather than Superman/Wonder Woman but the latter was an awful relationship to me so I wasn't bothered by it at all. This issue is continuing to mix action, character moments, plot, mystery and pacing so I can agree with you on its strengths. That bit where Superman punches Doomsday over 4,000 times had me all giddy from the awesomeness. It was, I love seeing Superman being able to cut loose, and I like the acknowledgment that DC's heroes would teach me another tricks. 'Clois'... when DID the Super-Smallvile fans start using that, it's so 'Brangelina'. I'd not seen that Tweet, cheers Louis. One thing that bothers me...superman explaining what doomsday is to Diana and Luthor. Diana had faced doomsday - a version of it at least -. She even had her arms broken. Yet nothing of these is mentioned. I just simply can't ignore things like these. That bugged me, too -- and I didn't even read that story! You're both right, it should have been mentioned , given how ruddy long we had to put up with New 52 Doomsday. I can't tell whether the return of Wally amid storms means the continuity may have changed slightly again. 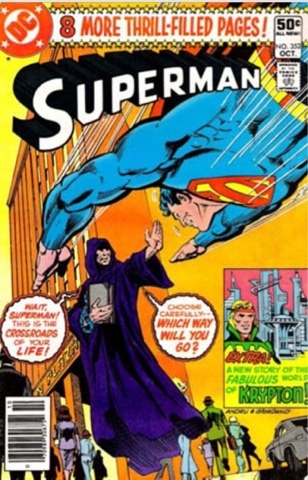 I love that Superman-Destiny teamup -- the cover jumped right out at me when I was a kid! Was that the first time Destiny was used as an in-story comics character rather than a narrator? WAAA-HOOOO! The book is good! Superman lives again. For real!